The ill-fated Andrea Doria was built for Italia (the Italian Line) by Ansaldo of Genoa. 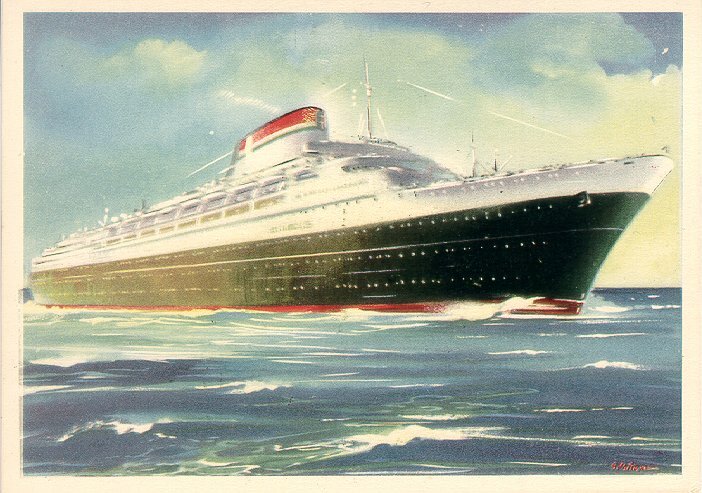 Launched in 1951, she made her maiden voyage from Genoa to New York on 14 January 1953. Late on the evening of 25 July 1956, southwest of the Nantucket Lightship, Andrea Doria (approaching New York) and the Swedish American Line's Stockholm (leaving New York) were closing in on each another. Although they were only a few miles apart, Andrea Doria was sailing through a thick fog, while Stockholm was traveling under a clear, moonlit sky. A little before 11 pm each ship picked up the other on radar but each concluded that the other was closer to the shore. As they neared one another, each ship turned to give the other more room to pass, but they both turned seaward. The result was disastrous: Andrea Doria's new course took her directly across Stockholm's bow and she was rammed broadside. Stockholm cut through seven of Andrea Doria's fourteen decks just aft of the bridge, killing 46 people on the Doria and five on Stockholm. Within minutes, Andrea Doria was listing to starboard more than twenty degrees, which was beyond her design capacity. Knowing that his ship was doomed, Captain Piero Calamai ordered an evacuation. Only half of the ship's lifeboats were available -- the port-side boats were unusable due to the ship's list -- but with assistance from Stockholm, the French Line's Ile de France and several other ships, all of Andrea Doria's surviving passengers and crew were rescued. Throughout the night Capt. Calamai remained on board, still trying to save his ship, but by 5:30 am the starboard list exceeded forty degrees and the remaining crew refused to leave without him, so Capt. Calamai finally left the ship himself. 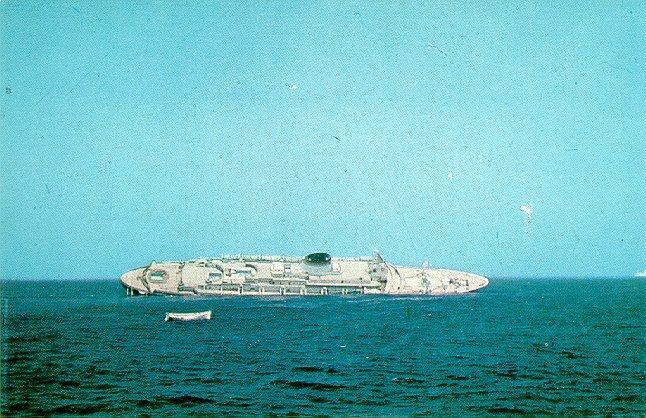 Andrea Doria finally turned on her starboard side and sank at 10:09, bow first, in about 250 feet (75m) of water. Sources: Bonsor's North Atlantic Seaway; Ballard and Archbold's Lost Liners; Watson's Disasters at Sea, 2nd ed.